Major media outlets have provided little or no coverage of a Democratic congressman's suggestion the government would use "nukes" against Americans who resisted efforts to confiscate semiautomatic weapons. On Friday, during an exchange over his proposal to confiscate certain firearms, Representative Eric Swalwell (D., Calif.) suggested the government would use nuclear weapons against Americans who resisted confiscation efforts. "And it would be a short war my friend," he tweeted. "The government has nukes. Too many of them. But they're legit." Swalwell later claimed his suggestion the government would use nuclear weapons against Americans was "sarcastic" but did not respond to a Washington Free Beacon request for comment or clarification of his views. 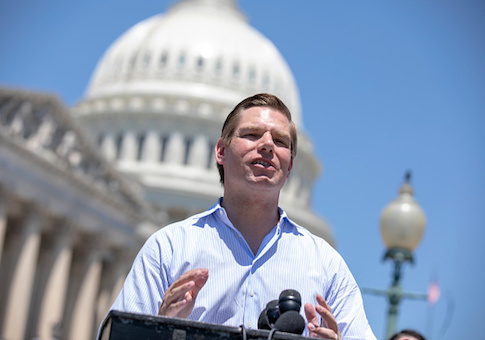 Swalwell's comments were widely criticized by Republicans as well as gun-rights activists. Rep. Liz Cheney (R., Wyo.) and Rep. Thomas Massie (R., Ky.) condemned Swalwell's statements. NRA spokeswoman Dana Loesch responded to Swalwell by saying "threatening (either seriously or even facetiously, progressives tell me nuance and euphemisms are dead and everything is literal in meaning) voters with nukes because you, not they, don't understand the argument is both bad lawmaking and advocacy." A Free Beacon search of television archive TVEyes found zero mentions of Swalwell's comments or the reaction to them in coverage on ABC, CBS, NBC, CNN, or MSNBC. A search of those outlets' websites returned zero results as well. A search of the New York Times website found zero stories on the comments. CNN interviewed Swalwell the day after his comments suggesting the government might nuke Americans in a hypothetical gun confiscation effort but did not ask him about his tweets or even mention them, instead asking him about President Trump's comments on Nancy Pelosi. The Washington Post included one of Swalwell's follow-up tweets in a daily news roundup, and 51 words out of a 3,000-word David Weigel newsletter. That newsletter dedicated 12 of those 51 words to note that "There was no corner of the Internet where this went over well." The paper provided no other coverage of Swalwell's comments. In contrast, Fox News dedicated several online stories to the congressman's comments. Fox & Friends also discussed the story on air, as did Tucker Carlson. Swalwell's comments also garnered stories from many right-leaning media outlets. The Washington Free Beacon, Washington Times, Blaze, Washington Examiner, and a host of other conservative outlets covered the congressman's comments. Despite the relative silence on Swalwell's "nuke" comments, controversial comments made by others have received a great deal of coverage from major media outlets in the recent past. In October 2016, former Republican congressman Joe Walsh tweeted he would be "grabbing [his] musket," if Clinton won the presidential election. News outlets gave the comment widespread attention. NBC News wrote a story on the comments. MSNBC asked Walsh about the comments live on air. CNN ran pieces on air and online. The Washington Post did multiple articles on Walsh's comments including one satirical piece entirely dedicated to Walsh's tweet. More recently, reporter Eddie Scary posted a tweet last week with a photograph of Representative-elect Alexandria Ocasio-Cortez (D., N.Y.) from behind and commented on her appearance, saying "that jacket and coat don't look like a girl who struggles." The resulting controversy and backlash received widespread coverage across major print and television outlets. "Twitter lights up after journalist comments on Alexandria Ocasio-Cortez's outfit," an ABC News headline read. A New York Times piece recounted how Ocasio-Cortez was reinventing social media use. The Washington Post featured a headline describing how "Alexandria Ocasio-Cortez wore clothing, a journalist tweeted a photo, and the Internet pounced." This entry was posted in Issues and tagged Eric Swalwell, Gun Control, Guns, Media Bias. Bookmark the permalink.